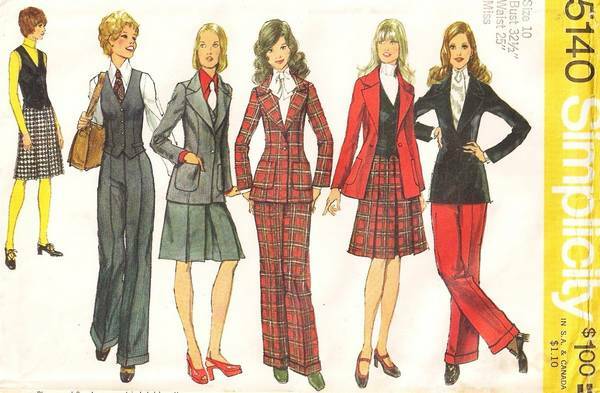 Vintage Simplicity 5140 sewing pattern for separates with some early 70's Disco Era features. The lined blazer with wide lapel collar is fitted with curved panel seaming, both front and back. 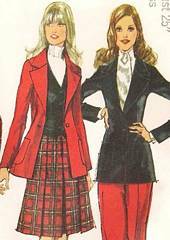 Wide legged pants with front zipper have waistband and turn back cuffs. Lined vest has V shaped neckline, slits in side seams and back buckled belt. Top-stitched skirt with front pleats has back zipper and waistband. Size 10, Bust 32.5, Waist 25, Hip 34.5.